Paul McCartney had taped a demo of The Fool On The Hill on 6 September 1967. During this evening's recording session The Beatles began proper work on the song. Three takes of the backing track were recorded, followed by overdubs. By the close of the session The Fool On The Hill featured two pianos, drums, acoustic guitar, recorders and lead vocals. A reduction mix, numbered take four, was also made. A mono mix was made towards the end of the session, which drew to a close at 3am. The work in progress can be heard on 1996's Anthology 2. Also present at the session were two Japanese journalists: reporter Rumiko Hoshika and photographer Koh Hasebe from the magazine Music Life. 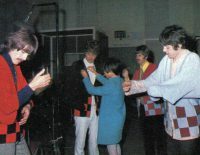 A number of photographs of The Beatles at work were subsequently published, and rehearsals of the song and interviews were also recorded. 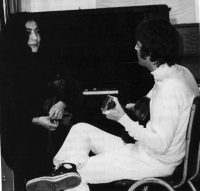 This is believed to be the first Beatles recording session attended by Yoko Ono. She was photographed on the day talking to her future husband John Lennon. What is really interesting about this session, is that Yoko Ono turned up. A photo of her taking to John exists. 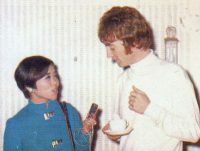 It looks weird, seeing the short haired ’67 John with her! I’ve never seen that photo. Where can I find a copy? Joe, look under “The Beatles Photo Sessions”, then click the “Fool On The Hill” sessions of September 25, 1967 and you will see a black and white photo of J & Y. Presumably the first. Well I never. Thanks for that. I’d never seen those pictures before. For anyone else interested in seeing them, here’s the link.